Last updated 18:00GMT, Wednesday 25 February. TODAY: very busy freight traffic Dover, Calais + Dunkirk, also busy Eurotunnel freight UK. Heavy snow Spain Pyrenees, see DGT.es (roads marked red need chains, black closed), with several ski stations closed on France side, Hautacam, Cauterets, Luz-Ardiden, Superbagneres. N20 Puymorens Tunnel re-opened (again, see below) avalanche risk. New storm warning Iceland. Weather disruption this week ferry services Brittany Ferries UK-Spain and knock-on disruption to Portsmouth/Plymouth-Roscoff/St Malo over the weekend. YESTERDAY: snow chains needed Val d’Isere, French Alps (except 4×4 vehicles), see @SimplyValdIsere. N20 Puymorens Tunnel French Pyrenees closed temporarily – twice – avalanche risk. Poor visibility east Germany. Dense fog A2 Graz, south Austria. Freezing rain Harz Mountains, north Germany + storm alert Iceland. NEWS: surreal Swedish roadscapes from a Berlin-based ‘photo-manipulation’ artist. A British man survives a spectacular Mallorca mountain crash as Cadiz’s new bridge gets an opening date. Swiss campaigners demand action on Gotthard freight movements. It seems foreign drivers won’t get away with the Gothenburg congestion charge after all..
CHANNEL DELAYS: DFDS Dover-Calais delay 15mins. P&O Dover-Calais running ‘within 20mins of schedule’. Eurotunnel freight UK, busy, still 30min wait before check-in. Condor Ferries Clipper delay 2h00, weather. WEATHER ALERT: red alert snow Spain Pyrenees + amber alert high winds, coastal storm Spain, Portugal, floods, avalanche France, heavy rain Sardinia, Sicily, snow, high winds Italy, high winds Norway, Croatia, heavy rain Greece. WEATHER: unsettled central + east Mediterranean and more rain France. MAJOR TRAFFIC DELAYS: A84 westbound Caen-Avranches, earlier vehicle fire, delay increased to 60mins. A2 northbound into Maastricht, accident, road works, delay 55mins. A2 eastbound from Hannover, accident Peine, delay 1h40. A44 southbound into Kassel, earlier accident, delay down to 50mins. Earlier: now no delay A1 northbound into Bremen. A27>A8 eastbound Lille-Tournai, earlier accident, road works, delay down to 30mins. A46 eastbound from Dusseldorf lane closed delay down to 5mins. A35 northbound into Strasbourg, road works delay down to 10mins. 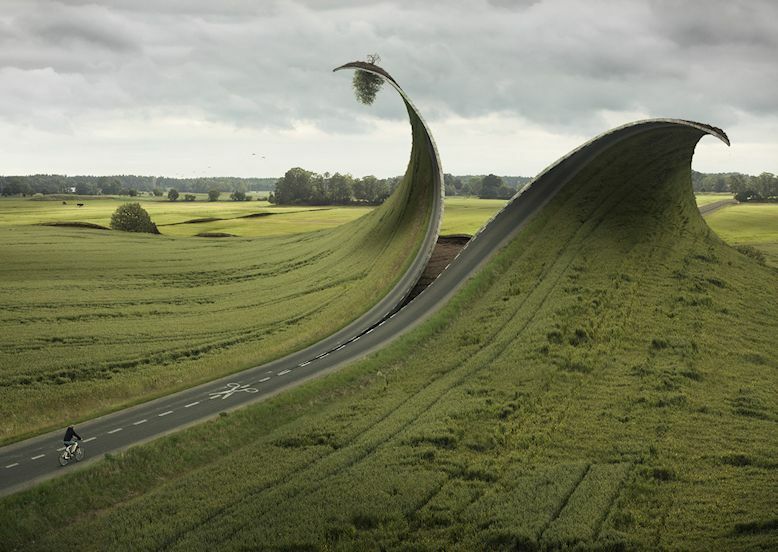 Cut & Fold: Swedish surrealist photographer Erik Johansson is noted for his twisted landscapes. Citing Dali and Magritte among his influences, Johansson only uses images taken by himself, mostly around his parent’s home in Gotene central Sweden (not far from Beowulf’s burial mound at Skalunda, incidentally, on the southern shore of Lake Vanern). See more at erikjohanssonphoto.com. roundup: SPAIN. A tourist survived a spectacular 40m barrel roll off the scenic Andratx-Estellencs road in the west of Mallorca yesterday suffering only cuts and bruises. Photos of the scene show severe damage to the car. The British man in his forties, according to local reports, tested positive for alcohol. Meanwhile, the controversial Puenta de la Pepa bridge across to Cadiz is almost complete and will open in May says TheOlivePress.es. SWITZERLAND. Failure to switch freight from road to rail violates the constitution say campaigners after a new report. The government target – set after a referendum in 1994 – is a limit of 650,000 freight movements through the Gotthard Tunnel, two years after the new railway Base Tunnel opens in 2016. Current journeys – 567,000 in the first half of 2014 alone reports SwissInfo – make that difficult to achieve. The Alpine Initiative group wants a daily internet auction of transit passes with prices capped just above the rail freight rate. SWEDEN. Despite a local referendum last September, when 60% of voters rejected Gothenburg’s only recently introduced congestion charge, the council has yet to cancel the scheme. A political party has now submitted a motion to force the council to recognise the result according to Goteborg Daily. The issue is that an ambitious package of mainly public transport improvements, including a railway tunnel, is dependent on the revenues from the congestion zone. The council says it decide what to do next in the spring. Since 1 January 2015 all foreign cars entering Gothenburg during the day have to pay. The charges vary depending on the time of day, up to a maximum 60SEK (£4.60). See ePass24.com for more.